The Karluk set out in 1913 in search of an undiscovered continent, with the largest scientific staff ever sent into the Arctic. Soon after, winter had begun, they were blown off course by polar storms, the ship became imprisoned in ice, and the expedition was abandoned by its leader. Hundreds of miles from civilization, the castaways had no choice but to find solid ground as they struggled against starvation, snow blindness, disease, exposureand each other. 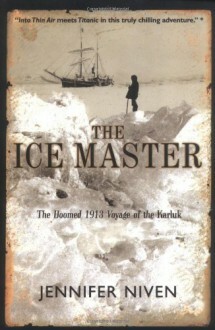 After almost twelve months battling the elements, twelve survivors were rescued, thanks to the heroic efforts of their captain, Bartlett, the Ice Master, who traveled by foot across the ice and through Siberia to find help. Drawing on the diaries of those who were rescued and those who perished, Jennifer Niven re-creates with astonishing accuracy the ill-fated journey and the crews desperate attempts to find a way home. Interesting, but none of the characters really "gripped" me and the maps were maddeningly insufficient.